The Naval Diplomat recounts the story of a veteran and Medal of Honor recipient from the Spanish-American War. Editor’s Note: The follow are prepared remarks that were delivered at a ceremony honoring George P. Brady, a veteran and Medal of Honor recipient from the Spanish-American War, at the Island Cemetery in Newport, Rhode Island on Memorial Day. The Island Cemetery is also where Commodore Matthew Perry is buried. For more on the event honoring Brady, click here. Friends … Today I want to share with you a tale of war, of politics, and of courage. Like all Memorial Day stories, this is the story of valor in a cause larger than self. It is the story of valor under the most trying circumstances most of us can imagine. Today we honor Chief Gunner's Mate George Brady, who was awarded the Medal of Honor for heroism at the Battle of Cárdenas, Cuba, during the Spanish-American War one hundred fifteen years ago. This is a story of fateful consequence for our Republic. By the close of the nineteenth century, the United States was making its ascent to world power. The United States Navy was recovering from what Captain Alfred Thayer Mahan, the second president of the Naval War College, called a period of "dead apathy" following our Civil War. That was a time of neglect, when our navy was inferior to that of Chile, to say nothing of European navies. The American naval renaissance commenced in 1883. That year — at the urging of sea-power advocates such as Mahan, Theodore Roosevelt, and Massachusetts Senator Henry Cabot Lodge, Congress ordered the keels laid for the United States' first armored, steam-propelled, big-gun fleet. This was the fleet that would fight against Spain fifteen years later. By World War I it would swell into "a navy second to none," and by World War II into the two-ocean navy we now take for granted. Its defeat of Spain proved that the United States could defend the Western Hemisphere against European empires, which had a habit of making mischief in places like Mexico, Peru, and the Dominican Republic when left unopposed. It also marked a revolutionary moment in how Americans thought about the world. Having looked inward for most of the nineteenth century, while the nation was subduing a continent, they now looked outward. To make a long story short, army and navy forces seized islands such as Cuba and Puerto Rico. They also wrested away the Philippine Islands, where Admiral Dewey's fleet smashed a Spanish squadron. Congress and the McKinley administration soon annexed many of these conquests. That made America an imperial power overnight — for better, and sometimes for worse. Annexing Hawaii, Midway, and Guam laid the stepping stones to America's Far Eastern holdings, providing bases for fuel-thirsty merchantmen and men-of-war lumbering westward across the Pacific deep. So Chief Brady was part of great events. But let's remember that, for all its political purposes, war is a human endeavor. People, not machines, fight. War is a violent clash of human wills, brimming with hardships, loss, and, as Oliver Wendell Holmes put it, "the passion of life felt to its top." Who was George Brady? Born an Irishman in 1867, he emigrated to America and enlisted in the United States Navy in 1884. He moved smartly up the ranks. 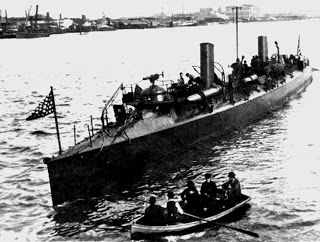 At Cárdenas a flotilla of light combatants — two torpedo boats, including Brady's ship USS Winslow, along with two gunboats and a cutter — stood into the harbor to reconnoiter a ship lying pierside. Opposing American entry were three Spanish gunboats. The Spanish vessels concentrated their fire on Winslow, knocking out her steering gear and incapacitating or killing the senior officers. Unable to steer, the ship made easy pickings. Our navy and army never took Cárdenas — testament to the fortitude of the Spanish foe. Life in the rudimentary steamships of that age was hellish, even in peacetime. Coal dust, dangerous equipment, and sweltering heat were the rule. Thrust into the captaincy, Brady nevertheless kept up fire against the enemy, attempted to restore steering, and directed damage-control efforts that preserved the ship's watertight integrity when its sides were pierced. His efforts let Winslow remain afloat and exit the battle zone safely under tow. He saved his ship, and his shipmates, and was decorated with the Medal of Honor for his selfless acts. Having served as a gunnery officer in a battleship at war, I feel as though I'm honoring a brother-in-arms today. When I was preparing my remarks, I kept seeing the faces of Master Chief Gunner's Mate Bob Eisenberg … Gunner's Mate Second Class TeRodney Russell … Lieutenant Commander Ernesto Zambrano … and many other shipmates from my day. These were men with whom, I daresay, Chief Brady would be proud to serve. People of valor live today. Many wear military uniforms. But as the stirring response to the Boston Marathon bombings reminds us … they come from every walk of life. May it remain ever so. Finally, while we are here to celebrate his life and his deeds, I would be remiss not to point out that Chief Brady fell not from enemy action but by his own hand, on board USS Monongahela at Portsmouth, New Hampshire, a few years later. Military suicide is a real and serious problem. I would urge veterans to watch out for their buddies, even after returning home from combat duty, and even after taking off the uniform for the last time. Having your buddy's back is what brotherhood is all about. How Chief Brady met his end detracts not the slightest from his gallantry in life. On this Memorial Day, let us resolve to match his example.